How a vintage pair of wranglers sparked a career in fashion. Once upon a time, in the land of hairspray, rhinestones, colored denim, and shoulder pads (just kidding, that was before our time), I encountered a 5’3” rodeo queen with a big personality and a smile to match. She was strong, confident, and outgoing, but when I met her I could tell there was something more that made her unique. She was not the typical rodeo queen I had known or even had been myself. She was different. She brought back vintage polyester men’s Wranglers (the kind that only 80-year-old men wore at the time) and made them cool again. Did I mention the fact that they came with a built-in crease, the ingenious invention that allowed fewer trips to the starch factory at the dry cleaners? She would pair those high-rise Wranglers with an off-the-rack button up from Nordstrom, a statement pair of Rocki Gorman earrings, and add some layered rings and bangles for a final touch. When it was all put together, her outfit radiated that she knew fashion and that she was not scared to be different. You see, back in that time, rodeo queens fit a certain style mold, one that Kadee, and myself, wanted to see evolve into more of a western-meets-mainstream crossover. We connected over fashion and became friends instantly. She was Miss Rodeo California, Kadee Coffman, and I was Miss Rodeo America. As we traveled together and had a wonderful year making lifelong memories, neither of us knew that our paths would again cross in the future, yet again, for the love of fashion. Fast forward 10 years, and today my 5’3.5” (I think she grew) friend is a true leader in the western fashion scene–owning that title again for not following any mold, but instead creating her own. 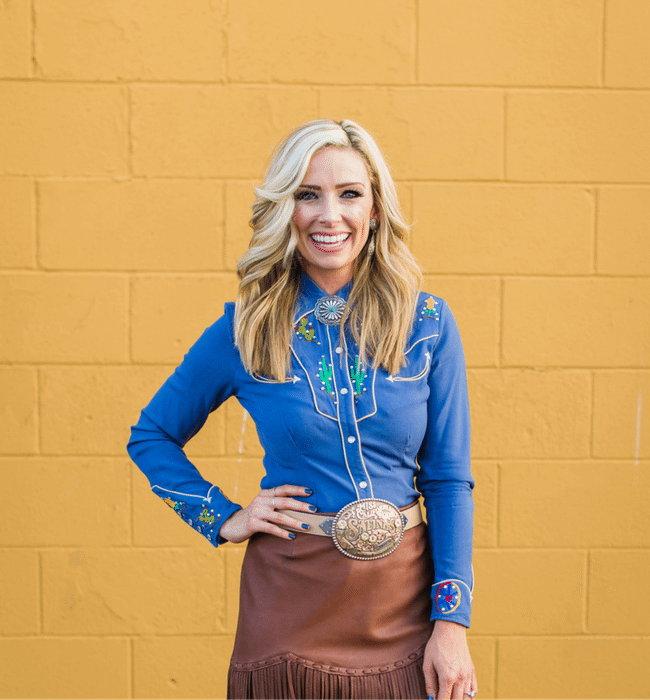 You might know Kadee as the TV personality who commentates nightly from the Wrangler National Finals Rodeo (WNFR), interviewing each of the round winners and giving behind the scenes updates. Maybe you know her from her time on multiple RFD-TV programs, together with another former Miss Rodeo America, Pam Minick. Or possibly, even yet, you know Kadee from her work in fashion at the Dallas Market Center, where she serves as the Vice President of Multimedia Communications, known for talking trends, brands and markets with both leaders in the wholesale and retail industry. Rachel Zoe once said, “Fashion is how you introduce yourself without ever having to speak,” which has certainly rung true for our friend Kadee. Growing up on her family’s ranch in Clovis, California, early on Kadee understood the value of western culture, it’s emphasis on hard work, integrity and the value of setting a big goal to achieve. “As a rodeo queen you are asked to do a lot of TV interviews, and I quickly came to realize I’d much rather be the one asking the questions than answering them! That’s when I knew I wanted my future to be in TV,” she shared. After her year as Miss Rodeo California in 2007, she was asked by a family friend to host a TV program on RFD-TV, rural America’s most important network. She also had returned to school to receive her Bachelor of Science Degree in TV Journalism. Not long after, she moved to Fort Worth, Texas and began reporting on multiple channels including, CBS Sports, NBC Sports, Great American Country and more. Although Kadee was no stranger to the rodeo world, it was not until 2012 that she was asked to cover her first rodeo, Cheyenne Frontier Days. Known to most as “The Grand Daddy of ‘em All,” and for being one of the largest, oldest rodeos in the country, all of which naturally heightened Kadee’s nerves a bit. During that time, she had set her sights on reporting at the WNFR. Now as everyone in agriculture knows, you do not harvest your crop the same week you plant it. It took over three years of updating her TV reel as often as possible and honing her craft before she even got an email in return. Though, she admits that she was thankful for that time which allowed her to mature professionally to handle the intense pressure of LIVE TV at rodeo’s Super Bowl, which is an entirely different ballgame than even Cheyenne coverage. You may notice in-ear monitors during the NFR telecast which are essential for Kadee to communicate not only with the TV truck outside but with the other commentators as well. It is very likely after she asks a go-round winner a question on-camera, her producer patches in and talks to her while the guest responds. It could be sharing news from the statistician as it pertains to that specific athlete, or that they are running short on time, etc. With so many things happening at once, and did we mention doing it all LIVE, it is no wonder there is a lot of pressure for this position. Behind these interviews, Kadee credits her fellow crew for everything running smoothly, which includes more than 65 team members, including camera operators, directors, producers, audio team and more. We asked Kadee about a memorable NFR interview she will never forget, and she laughed as she recalled telling Levi Simpson and Jeremy Buhler off-camera they won the Team Roping World Championship in 2016, but they did not believe her! Nightly around the world, as viewers tune into the WNFR, many ladies, young and old, admire Kadee for being the often solo woman telling the stories of many, and long to be in her shoes someday. Or perhaps at least own shoes like hers someday. When it comes to Las Vegas, it is not only the pinnacle of America’s original extreme sport, but it’s also the height of what should be considered Western Fashion Week. Just like any other fashionista out there, we wanted to know the in’s and out’s of how Kadee makes her outfit selections. With a crazy schedule of daily appointments and getting to the TV compound at 3:30pm daily to go over the upcoming go-round, match-ups, injury reports, and more, Kadee quickly realized that having a fashion change of heart is not an option. With a personal style that could be described as sophisticated with a hint of edginess, pairing a Dale Evans meets Jackie O flavor, Kadee leaves many fashionistas looking forward to her nightly outfit choices. “My fashion inspiration comes from many Instagram boutiques, specialty stores and did I mention I love vintage? Saying that, my spirit animal, Olivia Palermo (“OP”) influences my love of blazers. I can promise I have more colors and styles than anyone reading this,” she assures! “Keep in mind, for me and being on the telecast, less is more. We shoot from the chest up (that’s a tight shot) and if I have too much going on, be it a lot of jewelry, layers, patterns, or textures, it’s too much for TV. Off camera, I’m all about “overdoing it” on just about everything when it comes to fashion but for TV – I keep it simple. At 5’3.5” I don’t have too much extra room,” she jokes. Away from the WNFR, Kadee may have a leg up on all of us when it comes to trend spotting. As the Vice President of Multimedia Communications for Dallas Market Center (DMC), Kadee works daily with the DMC team, exhibitors and global retailers to share style news and industry insight. She has led the charge to bring a new dimension of coverage to DMC, including “Conversations with Cindy”, a video series with CEO Cindy Morris giving buyers and exhibitors updates on upcoming markets, developments on campus, as well as ongoing market reports during Dallas’ already hectic market weeks. Kadee and DMC were the first market center in the country to launch this type of communication channel, allowing them to lead the way into a new period of retail. Although she may be covering all genres of fashion at Dallas Market Center, Kadee assures that her western roots are key to her signature style–just as western lifestyle and fashion is the foundation of Americana. No matter what trend may be upcoming, whether it’s high-level fashion, furniture or accessories, there’s always a little bit of cowboy or cowgirl in all of us. “Ralph Lauren is a testament to that, where models wear cowboy hats with their high heels, complemented with fringe leather pants, or how Balmain completed almost each look in his latest collection with a western bolo. The western influence is everywhere and it’s here to stay,” she assures. While the past 10 years of Kadee’s career have been one that many dreams are made of, she shared that TV may not have always been her number one ambition. If there is one thing we know to be true, it’s thanks to Kadee’s roots, her upbringing, connection with organizations like Miss Rodeo America, RFD-TV, DMC, and many more that have cultivated her hardworking and upbeat personality. Cheers Kadee, to another fabulous year of fashion, rodeo coverage, and inspiring others to live out their wildest dreams. Ashley is the Founder at the Hub, and has a slight obsession with boots, jewelry, coffee and 80's Country Music. She may or may nerd out when talking about Facebook Ads and boutique owner business strategy.